Mumbaikars will have woken up to a change in the way they call ‘a’ name. The station that had become notorious not too long ago for a tragedy that impacted many – the stampede at Elphinstone Station- is now in the news again, albeit for a better reason if one were to compare. Naming and renaming is the privilege of those who wear the crown since time immemorial. Villages, towns, cities, states and countries- not forgetting oceans, seas, mountains, valleys and even stars, flora and fauna and yes even our own names- all given by those in some specific authority. Sociologically speaking, Re-naming has come to represent some sort of an indication of whose hands the power lies in. Think Mumbai, Chennai, Kolkata … which a few decades ago were Bombay, Madras and Calcutta! However, the question that begs to be asked is; In terms of real estate, how does this impact- if it does at all. Will the commercial spaces around the station up their rentals, now that there is a 300 year old historical reference to it? Will the road outside be any better overnight? BMC to send their A team to do the honours? Will Upper Worli which has this station as a connecting lifeline also attract luxury clients to its top end residential offerings? 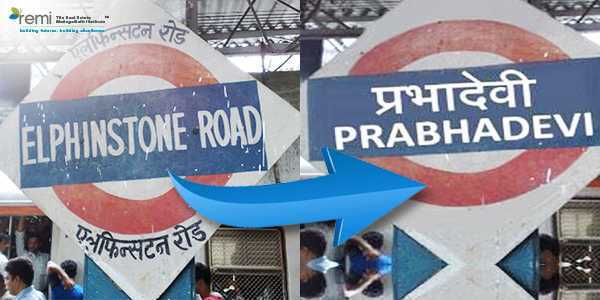 From Elphinstone to Prabhadevi , does that change the way one jumps into or is flung out of the compartment by your heaving, weighty, trying to not step on your toe co-commuter? Will the snacks served by the authorised canteen contractor be prepared with any more care and quality? Will the shoe shine boy charge a rupee more to polish your shoe till he can see his face in its reflection? Oh yes! Is the fare going to rise to and fro from Prabhadevi to cover rebranding costs.. that would be too bad if it does….maybe many will choose to skip this station all together then! Let’s have your views on this ! Our flagship Certifications in Business Management and Housing Finance (BMF 201), the Broker Certification Program (BCP 201), the Owner Developer Program (ODP) are just the tip of the iceberg. Our ability to curate industry-relevant programs with experts and thought leaders is our specialty. We currently offer 30+ programs for real estate.